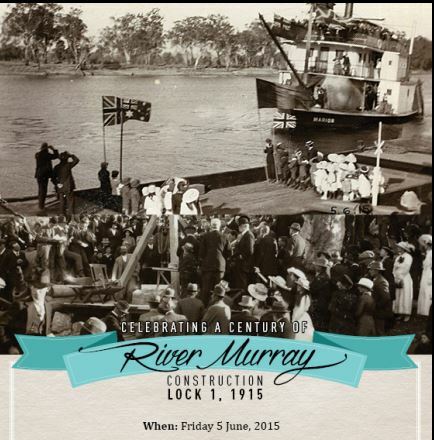 What a fabulous year 2015 has been, celebrating the centenary of lock building on the Mighty Murray. So grateful that my years of research and writing finally came to completion with the publication of the history which pays tribute to the men and women whose lives and work led to the accomplishment of this great engineering feat. Thanks to all who have supported my work in any way and to those who have purchased a copy of the book. My life has been greatly blessed by meeting so many wonderful people. Happy New Year everyone! This tree at Lock 7 depicts a similar one to what the community would have put up at Lock 9 years earlier. On December 13, a heatwave of above 100 degrees F came to an end when about an inch of rain fell, a steady soaking rain. On Monday December 8, the Georgian vaudeville company visited the camp and a reasonable attendance enjoyed the entertainment. On Wednesday December 10, a concert organised by Tom Irvine was given before a crowded house, the proceeds being in aid of the children’s Christmas tree and sports. A varied and entertaining program consisted of an overture by Connie Reed, songs by Mrs Florence Reed and Mrs Mary Grosse, duets by the Gorman and Reed girls, quartets by Misses Gorman and Messrs Gorman and Bowell, songs by the schoolchildren and comic items by Bertie Pearson and Bertie Bowell, violin and mandolin numbers by Albert Charlton and songs by Arthur Gorman. A dance followed. On Christmas Eve, a wonderful Christmas tree was arranged for the children. The tree was erected on the lawns adjacent to the men’s quarters and it was decorated with toys, balloons and Christmas stockings. The many little electric bulbs illuminated the tree amid the surrounding darkness. Father Christmas, (Oliver Edwards) arrived by car and the children excitedly greeted him as he proceeded to distribute the toys. 122 children received a toy and stocking each. A plentiful supply of fruit, lollies, and cool drinks was provided. Mr. and Mrs. Albert Charlton provided music with piano and violin and there was plenty of dancing and games. 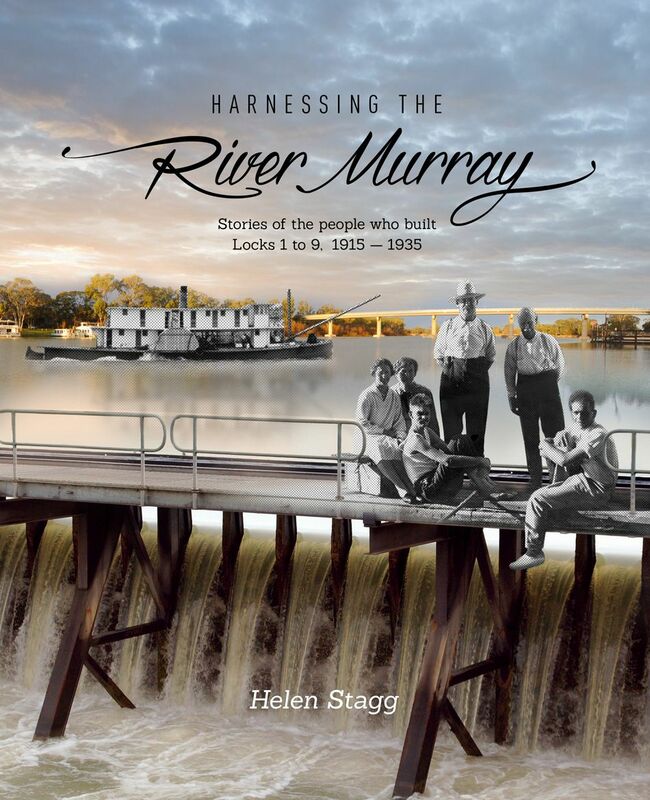 Max Pearson, who has inspired much of my work on researching lock and weir construction history, passed away a week ago; a man with a kind and generous heart and a passion for the River Murray, with always a story of life in the lock camps to share. He will be greatly missed. Max Pearson sharing a story from lock-building days. 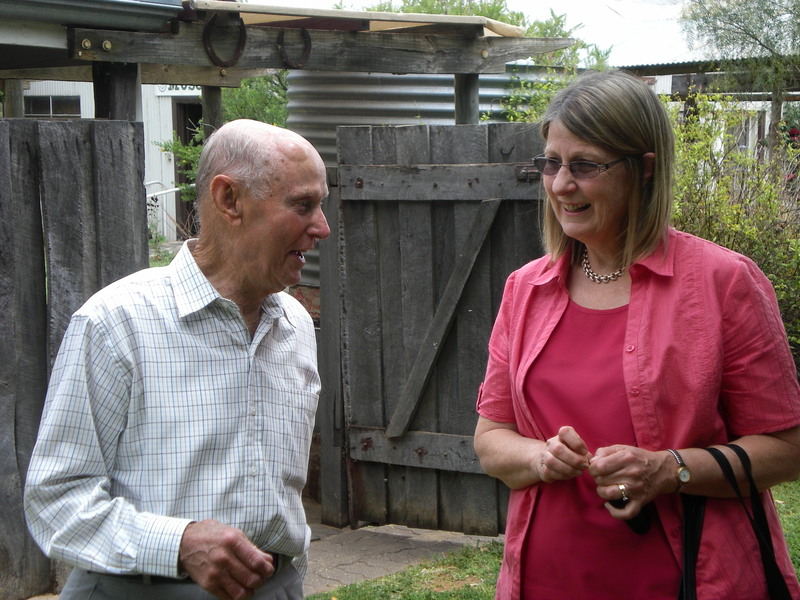 My association with Max began in 1998, when I telephoned him in response to an advertisement placed by a committee he had formed to arrange a reunion of lock-builders’ families. (I had intended to take my mother whose father was also a lock-builder.) My initial phone call to Max alerted me to his passion to tell the stories of the transient lock-building communities. Reflecting on this conversation ten years later, Max seemed a very suitable subject for my Oral History Unit interview, which was part of my Masters in History program in 2009. After the initial interview and project, I was inspired to pursue my research on the subject of lock and weir construction, and Max put me in touch with others who would have memories to share. 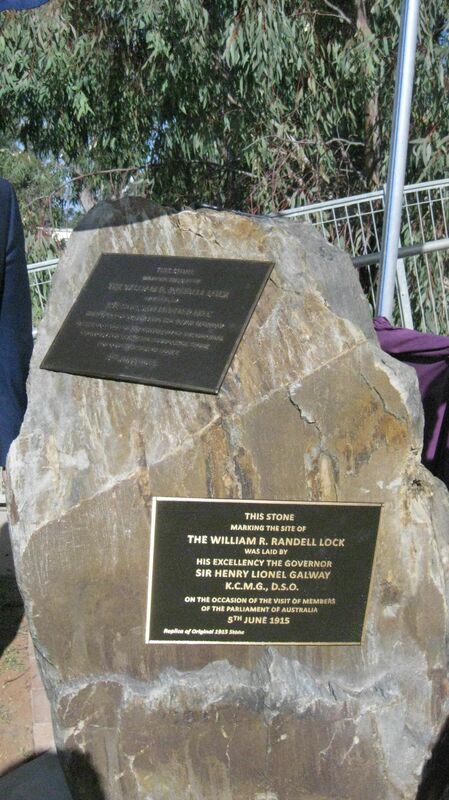 The friendship with Max developed over the years as I undertook the writing of a book, Harnessing the River Murray, the stories of the people who built Locks 1 to 9, 1915-1935, due for release on 5 June 2015, the centenary of the foundation stone for Lock 1 at Blanchetown. I enjoyed many conversations and phone calls with Max.When my archival research threw up a question, I would ring Max and get an eye-witness answer if I could. On several occasions, I met Max at Lock 7 site, where the little township once stood during lock construction, and he would point out the locations of the various parts of the camp, the school, the oval, the houses etc. 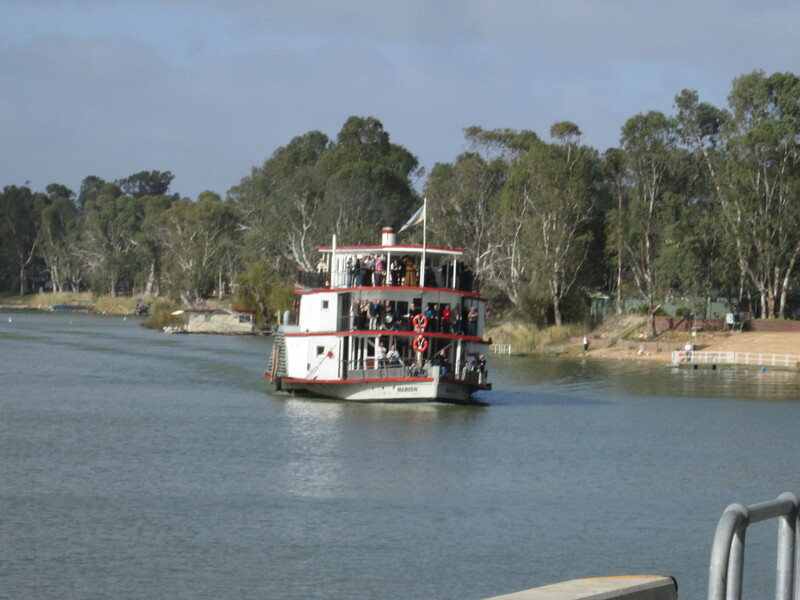 Max Pearson loved the Murray River and its history. He treasured its presence in his life, and I treasure the memories I hold of Max and our shared love of Lock and weir construction history. Thank you Max! RIP. I owe my fascin ation in Lock history to the stories my mother Evelyn told me when I was growing up about her childhood on the various locks where her father worked during construction. 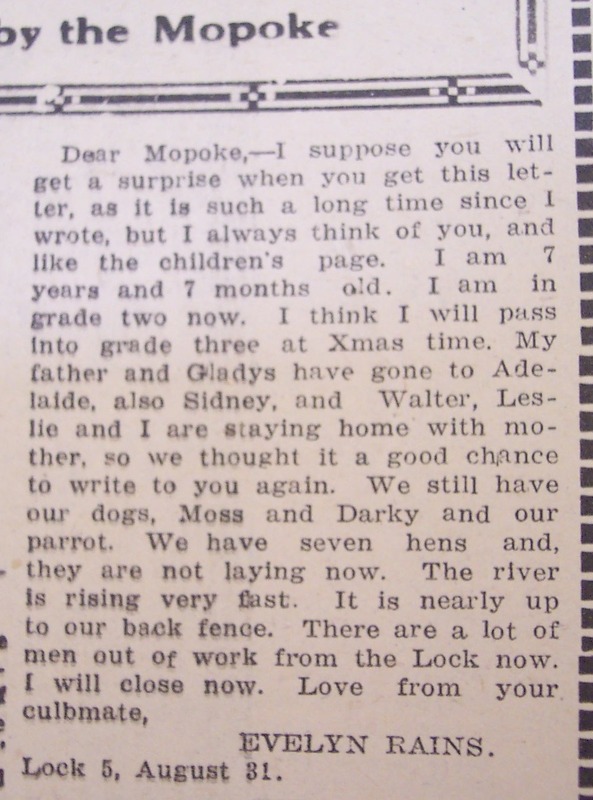 When the family were living at Lock 5, Evelyn and her brothers and sister wrote letters to the Children’s Column in the Renmark paper.One of them is attached for you to read, (1926 08 31) Today would be her 96th birthday and I honour her memory and the passion she instilled in me about our shared heritage.